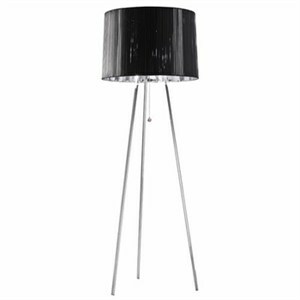 Floor lamp for ambient, direct/indirect illumination. White or tobacco silken ribbons are wrapped around the frame to form the shade of the Obi. The shade is then lined with a semi-reflective PVC chrome liner. The liner reflects and diffuses the light. Polished chrome legs support the shade. On/off pull switch features detailing on the chrome ball.